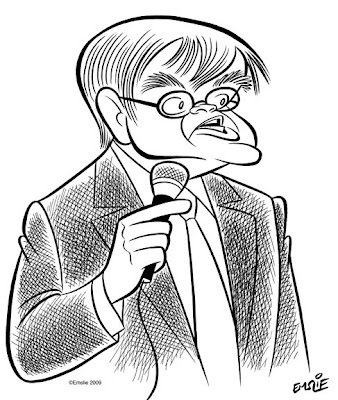 The Cartoon Cave: Happy Birthday, Garrison Keillor! Here's a guy I've always liked: American humorist and Public Radio personality, Garrison Keillor, host of A Prairie Home Companion. Back in the early 90s when I was living down in Florida, listening to Garrison's radio show every Saturday evening was a real treat. Interestingly, my introduction to Garrison Keillor was after he'd retired the original A Prairie Home Companion and had replaced it with The American Radio Company of the Air, having relocated from Minnesota for several years to broadcast from New York City. Still, the format remained much the same, though there were several new cast members in addition to his regulars like sound effects guy, Tom Keith. One of the new cast was the incredibly talented Ivy Austin, who could do all manner of comic characters as well as being a brilliant singer. Garrison took his show back to Minnesota in 1993 and rechristened it A Prairie Home Companion, and has made it a Public Radio institution in the many years it's been running. I used to love to sit out in my back enclosed porch during my years in Florida, a cup of coffee in hand, and listen to Garrison and crew create their always witty and entertaining theatre of the mind, as the sky turned pink and gold with the Florida setting sun. In the years I've been back living in Canada, however, I don't get to hear the show too often, as I can't usually pick up the local PBS radio station from Buffalo NY very clearly at home. Oddly enough, though, it comes through nice and clear on my car stereo, so there have been times where I just keep on driving around aimlessly so as to not miss any of Garrison's closing 20 minute monologue on the residents of Lake Wobegon. His soft midwestern voice can be absolutely mesmerizing as he spins his latest tales. I've discovered that there is a wealth of excerpts from the radio shows captured on video, made available by Public Radio on YouTube. Here's the link to check them out. very nice pete; I've only heard one or two of his broadcasts but I've greatly enjoyed his novels. Yeah, great going Garrison. Pork-laden and shockingly wasteful "stimulus" bill bullied into law, 10 year deficit conservatively projected at 9 trillion dollars, has authorized more spending in less than one year than all combined presidential spending since the country's founding 'til his inauguration, absolutely idiotic plan for socialized health care at a time when the country's expenditures are already completely unsustainable. Sensible endorsement indeed. This new guy's every bit as incompetent as Bush on his worst day. Nice drawing though. Regarding health care, again it's going to cost America far more in the long term to do nothing. There's too much wasteful spending on repetition of the same procedures for an individual's GP and specialists ordering the same tests, as well as too much money going into the pockets of insurers who will find any excuse not to pay out on a claim if they can avoid it. When I lived in Florida I was fine because Disney had a very good benefits plan, but I had friends, either self-employed or working for small companies, who were desperately afraid of getting sick enough to warrant a hospital stay, as they could not afford to purchase their own benefits for many hundreds of dollars each month. Sadly, for those trying to eke out a living as self-employed workers, especially illustration freelancers like my friends, the monthly rent trumps medical insurance. The risk they take, of course, is that a serious illness could financially destroy them for the rest of their lives. Happy Birthday, Jill St. John!